Dr. Andrew Neil Beckett, a Canadian Armed Forces Major and combat surgeon brings his experience and expertise to the MUHC’s Trauma Centre. On a bright afternoon, Dr. Andrew Neil Beckett, a Canadian Armed Forces Major and trauma surgeon, sits calmly in a café in the Montreal General Hospital of the McGill University Health Centre (MGH-MUHC). Without batting an eye, he explains how towards the end of a 36-hour shift in the MGH-MUHC Trauma Centre, he and his team saved a patient who had lost five litres of blood. Since 2014, Dr. Beckett is the only full-time Canadian Army Surgeon stationed in Quebec. 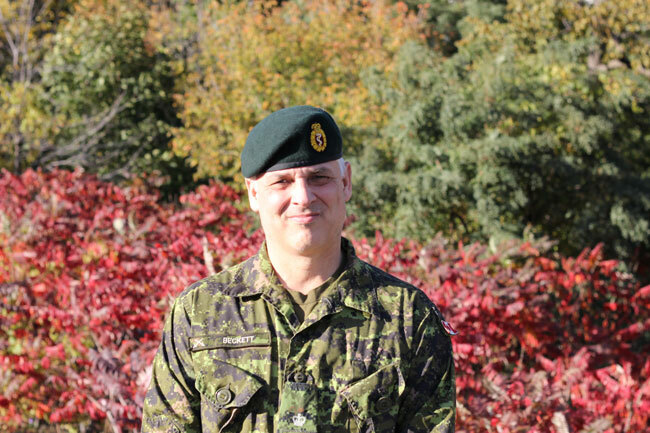 Thus, he can be called for duty anytime, but in between deployments, the Canadian Forces Health Services (CFHS) allows him to treat civilians at the MUHC. Dr. Beckett also took advantage of his stay in Quebec to learn French. In just two years, he mastered the language – with a charming accent – and passed the obligatory test of the Office québécois de la langue française (OQLF). Dr. Beckett’s decision to become a doctor is intrinsically linked to his very first tour of duty abroad. A native of Stouffville, a small town near Toronto, he dropped out of high school and at 18, looking for some adventure and travel, decided to join the army. In the summer of 1992, he was deployed to Yugoslavia as a medical technician supporting combat troops. “It was an eye-opening experience,” he says. “I saw the savagery of the ethnic fighting: the burning villages, the atrocities, the human suffering and death. That conflict somehow shaped me. During that first rotation, Dr. Beckett also cared for Canadian soldiers seriously injured in a land mine explosion. Since then, he has been working towards improving casualty care and trauma systems in the military. Taking inspiration from past military surgeons such as Norman Bethune and Lawrence Bruce Robertson, he developed the first CFHS Blood Program, which will bring blood products to the front lines within the first hours of an injury. In the future, he would like bring the same type of innovative program to Quebec, so that patients in remote areas can be kept alive long enough to be transferred to Montreal. On Nov. 24, Dr. Beckett will be the main speaker at the Montreal opening of the national travelling exhibition From Vimy to Juno (see details below) which highlights Canada’s role in the First and Second World Wars. For the combat surgeon, who is also a military history buff and has served in historical committees on military medicine, it’s important to remember the bravery and sacrifices of our soldiers. Organized in collaboration with the Juno Beach Centre and hosted by the RBC Art and Heritage Centre of the MUHC, From Vimy to Juno brings the legacy of Vimy Ridge and Juno Beach to all Canadians. The official opening of the exhibit will be held in Livingston Hall at the Montreal General Hospital on Nov. 24 from 1 p.m. to 2:30 p.m., and everyone is welcome. The exhibit, which will then continue in Peacock Alley until Dec. 4, will feature exclusive first-hand accounts of the wartime experiences of doctors and nurses from MUHC founding hospitals as well as facts about the No. 3 Canadian General Hospital (McGill), a unit that changed the direction of medical recruitment across Canada.